Entry Forms and details about the National Champs to be held in Taranaki, have been published. Entry forms are available for the NZ Open and Disabled NZ Open, to be held in Auckland. 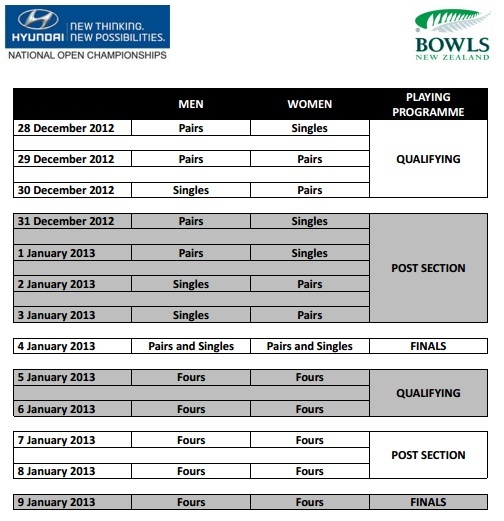 The Trusts New Zealand Open 2012, with a total prize pool of $32,000, will be played at bowling clubs across Auckland. Qualify for The Trusts New Zealand Open and take on the best of the best. The qualifying event will be played from 8th-10th November and is open to all affiliated bowlers. Bowlers successful in qualifying will win through to the main draw of the event, to be held 11th–16th November. We all know the great fun, relaxing and enjoyable game bowls is, so why not share the joy? Christmas Bowls involves renting your club out for Christmas Events where those who come along can also enjoy a game of bowls. Bowls has something unique which no-one else can offer, so make sure you let people know about it, and share it! Bowls New Zealand can help you to promote your clubs Christmas Bowls at no cost to you, all you need to do is use the logo. Phil Skoglund was elected today as the new president of Bowls Manawatu. In the annual general meeting held at the Palmerston North Bowling Clubrooms, Phil took over the reigns from Tony Jensen, the departing president. Anthony Woodley from Ashurst and Lyn Elphick from Takaro were elected vice-presidents. Also elected on the board were Norah Bacon, Noeleen Elston, Sharon Sims, Terry Puklowski, Vern Sixtus and Stewart McGrail. A special presentation was made to the former secretary, Irene Reilly for her contribution to Bowls Manawatu. Palmerston North Bowling Club wishes the new Executive and President the best of the luck for the new season. Resullts of Secondary School Competitions 2012 held at Bowls Heretaunga Complex on Sat and Sun 7 & 8th July. Girls Pairs. 1st Caitlin Thomson & Sophie Fisher Palmerston North High – Manawatu. Reserve, Lisa Simmonsen & S.Lange Hastings Girls High – Hawkes Bay. Boys Pairs. 1st Ryan Douglas & Cameron Hudson Gisborne Boys High – Poverty Bay. 2nd Damien Holder & Jake Woolford – Wairarapa College – Wairarapa. Girls Singles 1st Tianna White – Hukarere College – Hawkes Bay. 2nd Adele Critchlow – St. Matthews School – Wairarapa. Reserve – Heidi McLaughlan. Palmerston Nth Girls High – Manawatu. Boys Singles 1st Richard Hocking. – Taradale Hight School – Hawkes Bay. 2nd Dean Drummond – Hastings Boys High – Hawkes Bay. Reserve – Patrick Sims – Palmerston Nth Boys High – Manawatu. This is just a reminder that the National Bowls Awards are fast approaching.